Let UK Cleaning relieve you of one of the more unpleasant maintenance chores in your home. Spare your tooth brushes and knees by letting us brighten your ceramic and porcelain tile and grout. 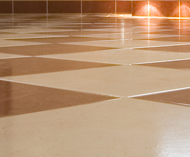 We will restore the natural beauty of your tile and grout quickly and economically using specially developed tile and grout cleaning solutions with state-of-the-art cleaning equipment. The grout between your tiles is porous and especially susceptible to collecting grime, which can build up over time and get quite ugly and unpleasant. Wait until you see the results Richard can achieve on your grout! And when he's finished, he can seal the grout to prevent dirt buildup and stains from discoloring your grout, so the shine will last much longer! If you are selling your home, we highly recommend having your tile & grout cleaned for a low-cost way to add sparkle and shine! Let UK Cleaning be your reliable tile & grout cleaning company. We guarantee you'll love the results. Give us a call today! Ask Richard about WHOLESALE FLOORING pricing. He has access to wholesale flooring pricing not available to the general public. If you need carpeting, hardwood, or tiles (natural - ceramic - porcelain) let us know!